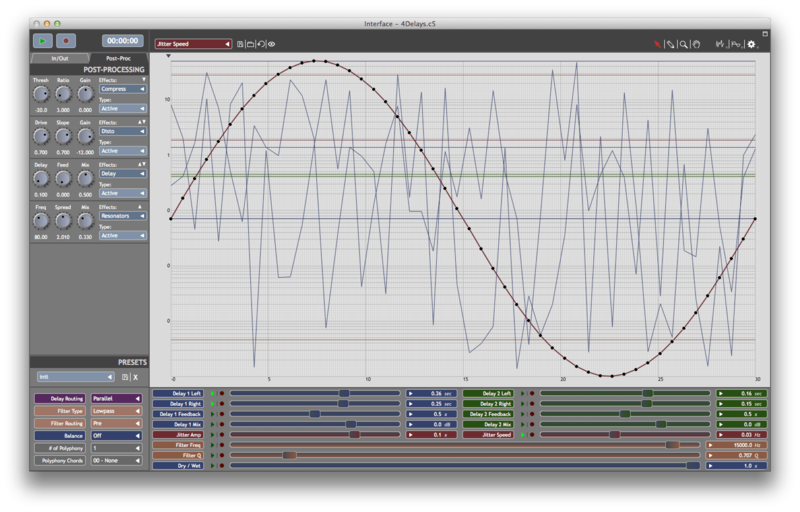 Cecilia is an audio signal processing environment aimed at sound designers. Cecilia mangles sound in ways unheard of. Cecilia lets you create your own GUI using a simple syntax. Cecilia comes with many original built-in modules and presets for sound effects and synthesis. Cecilia is free and open source (GNU GPL v3). Cecilia is programmed and maintained by Olivier. [*]Automatic saving of the module after creating or deleting a preset. [*]Revisited tooltips and html documentation. [*]All modules have been tested and cleaned. [*]Better handling of unicode characters in preferences file. [*]Better error handling when loading or running a cecilia5 module. [*]Added ChenLee attractor to the ChaosMod plugin. [*]Added various modulation waveforms to BinModulator module. [*]NEW MODULE: UltimateGrainer – A state-of-the-art granulation processing module. [*]NEW MODULE: RandomAccumulator – Variable speed recording accumulator module. [*]NEW MODULE: UpDistoRes – Distortion module with upsampling and resonant lowpass filter. DAW Aodix- for registered Users free to download! DAW Tracktion 6 (T6 DAW) Digital Audio Workstation Now FREE!